Isuzu Australia (IAL) has just celebrated 25 years at the top of the Australian truck market, which is no mean feat by anyone’s standards. However speaking at a celebratory function over the weekend senior IAL management took the opportunity to reflect on some of the massive changes that have taken place in the Australian truck market over the last quarter of a century, and the challenges of staying ahead of the game in an increasingly competitive market. IAL Managing Director and CEO Koichi "Mike" Yoda looked justifiably proud to be at the helm when this "remarkable industry achievement " took place but he also took the time to point out that "competition in this market is very strong with many rivals offering good product at discounted prices". And that "competition will never get easier." Given that Isuzu Japan stands alone without any European backing, Yoda also emphasised the importance of the Australian market in Isuzu’s global market. According to Yoda, Isuzu’s global sales and profitability are set to be at record levels by the end of the financial year. But it was IAL Director and COO Phil Taylor and recently returned Chief Engineer Simon Humphries who really highlighted the last 25 years of evolution in the Australian truck market. Humphries pointed out that in 1989 computer controlled truck engines were on the horizon but not established here yet, turbo charging was the exception rather that the rule and that Australian emissions levels consisted only of a visible smoke test. But success, according to Taylor has depended upon a strong dealer network, having the right business structure, the right people and the right product. Taylor also mentioned that customer purchase decisions were not so much driven by the truck itself anymore, but rather the size of a service network and value added services such as Isuzu Care which was launched back in 2005. "There’s not a lot of difference in the metal any more, product parity is becoming the norm." It became clear that the truck maker was not going to become complacent about itsstrong market position. Taylor summed up with the famous Warren Buffet quote "It takes 20 years to build a reputation and only 5 minutes to ruin it." 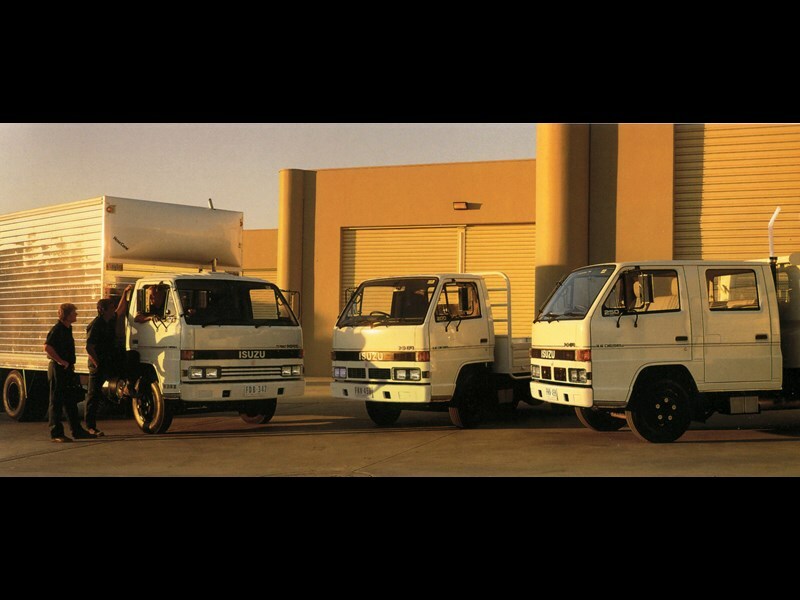 To emphasise the brands origins in Australia, the company also set out to restore an example of one of its early game changing models, the Isuzu SBR 422. The 8 tonne GVM truck was a revelation to many when it was introduced in 1978 into a market dominated by British and North American trucks, and there are many still on the road today. I was able to take the immaculately restored and gleaming piece of Isuzu heritage for a fun drive and found it to be real hoot to drive. That being said, I wouldn’t be rushing to complete a 12-hour shift behind the wheel, the naturally aspirated 135hp (97.5kW) 6BB1 engine and 5-speed transmission seems harsh in 2014 when turbocharged engines and automated gearbox’s are the norm. The SBR also featured an exhaust brake which was a rarity for the times, and it was hard not to grin when the "baby jake-brake" kicked in. While it may seem basic by today’s standards it was positively luxurious when compared to many of its Ford, Bedford and International contemporaries. It even had a radio.